This beautiful sight in my kitchen this week comes courtesy of my in-laws and a hectic work schedule. Yes, two things not normally associated with creating beauty. But a visit from my in-laws last weekend spurred me to buy fresh flowers, a luxury I don’t often enjoy. And my work schedule has me getting up a little earlier nowadays, right around dawn. 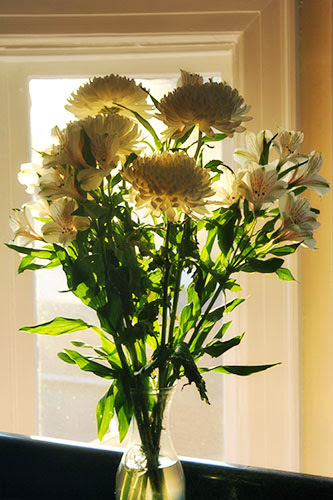 What could be two potential stressors instead has me spending my mornings with sunlight bursting through a bouquet of flowers. I think this is a literal illustration of finding beauty in everything.